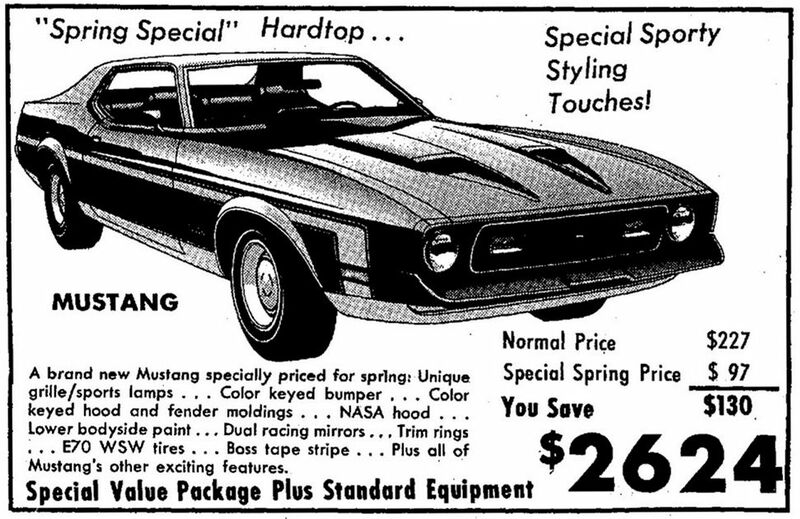 So what can anyone tell me about the "Spring Special" mustang? Not a lot of info out there. I know it was a coupe with Mach 1 styling (hood, stripes, bumper) but not much else. Cant seem to find a good value either. Quite a bit of info has been posted on here. Saw where someone said 9003 produced. Not sure where that number came from. EDIT: Apparently this info is came from "Mustang Special Editions" book And I am not sure how to determine one of these models using documentation - short of the specific equipment listed as line items. I would like to see a Marti Report and/or window sticker for one. I'd like to see a C, J or M code in that model! I like the weird/rare stuff like that. My bet is most of these cars ended up being parts cars for others!!! The package is sort of like the Mach 1 package for the Sportsroof. No performance gains unless you checked other boxes on the order. Ford was know for doing a lot of packages that made you think the car was fast but just smoke and mirrors. Examples would be the California Special, Twister Special, High Country Special, Sprint, etc. I do not think anyone is out there collecting these. If you like a coupe it does dress it up for sure. Sort of like the SS package or Super Sport package on a Chevy. In the beginning you could get a SS with a 6 cylinder. It was a dress up package. The ad you posted pretty much says it all. Looked in Marti's book and in 71 he lists 9003 Special Value Package Coupes. One of those must have had a stripe delete because he shows 9002 coupes with stripe, humm. Of course there were 6,247 Sprint coupes in 72. (09-25-2018, 09:24 AM)Carolina_Mountain_Mustangs Wrote: Looked in Marti's book and in 71 he lists 9003 Special Value Package Coupes. One of those must have had a stripe delete because he shows 9002 coupes with stripe, humm. Thanks David. There is a book; "Mustang Special Editions" by Brad Bowling and Jerry Heasley where this model is mentioned as well. (09-25-2018, 08:45 AM)Carolina_Mountain_Mustangs Wrote: The package is sort of like the Mach 1 package for the Sportsroof. No performance gains unless you checked other boxes on the order. Ford was know for doing a lot of packages that made you think the car was fast but just smoke and mirrors. Examples would be the California Special, Twister Special, High Country Special, Sprint, etc. Don't now a lot about them , but here is a picture of my parents Spring Special. They have owned it since 73'. I'm curious about the front bumper, i thought that aii 71 & 72 had the chrome ?